Throughout the offseason, sophomore Carter Putz and junior Landry Weber battled for Bishop Miege’s starting quarterback position. Putz is a Division I caliber baseball player who has already committed to Notre Dame, and Weber is the son of longtime Kansas State University broadcaster Stan Weber and a strong student of the game. They had to replace Ryan Willis, who led Miege to a 13-0 mark, Class 4A-I championship and the first undefeated season in school annals. Miege paced the classification in scoring at 45.8 points a contest and was considered, along with 5A Bishop Carroll, and 6A’s Olathe North and Shawnee Mission East, as the state’s four best teams. Putz and Weber battled for multiple months, including summer and the first two weeks of fall camp. On Monday of Week 1, the coaching staff told Putz he earned the starting job. The Stags immediately moved Weber to free safety. 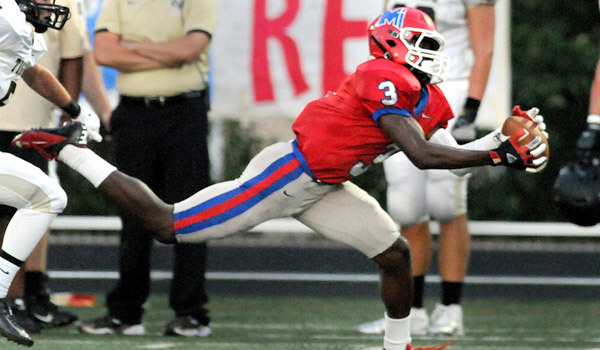 The choice has helped Miege become more explosive offensively than last season. The Stags, 11-1 and ranked No. 1 all season, have averaged a class-best 56.2 points. Their lone loss was a 42-35 Week 3 defeat to Blue Valley, who will play for the 6A championship on Saturday. Miege will face another high-octane attack in Andover Central (10-2) in the 4A-I state title game at Topeka’s Hummer Sports Complex. Central, second in the classification with 39.9 points per game, is playing its first-ever state title game. Andover Central coach Tom Audley, in his 29th year as a head coach, will coach in his first state title game. Miege has averaged 9.9 yards per play, up from 8.4 in 2014. Putz leads Kansas 11-man quarterbacks with 3,056 yards. He has completed 170 of 247 passes with 35 touchdowns against only five interceptions. Putz has thrown for more yards than Willis did in 2014. Willis is now the starting quarterback at KU as a true freshman. Putz has benefited from offensive coordinator Justin Hoover, one of the top quarterback coaches in the Midwest and one who works with Trent Dilfer and the Elite 11 program. Junior center Collin Grunhard, son of former Chiefs’ center and current Miege assistant Tim Grunhard, is the team’s best lineman. Left tackle Mark Golubski is a three-year starter; Holmes calls the senior one of the state’s most underrated players. Senior Kaelin Key leads Miege with 67 stops and 24 tackles for loss. Senior running back Dawson Downing, despite missing time earlier in the season with a broken hand, is again one of the state’s top rushers with 182 carries for 1,673 yards and 36 rushing scores. Junior Jafar Armstrong is third in Kansas in receiving yards with 61 catches for 1,232 yards and 15 scores. Defensively, Weber ranks fourth on the team with 35 stops and leads the squad with five interceptions. “He has done a great job back there at the free safety spot for us,” Holmes said. The Jaguars feature its own standout trio with senior quarterback Peyton Huslig, senior running back Jordan Birch and senior wide receiver/returner Darraja Parnell. Huslig has completed 104 of 175 passes for 2,025 yards with 30 scores against six interceptions. Birch, who committed to Illinois State, has rushed 289 times for 1,737 yards and 18 scores. Parnell has 49 catches for a Kansas-best 1,321 yards and 21 scores. Parnell also has five defensive/special teams scores, part of 11 D/ST touchdowns for the Jags. Three of those touchdowns have come on punts. Audley said Parnell is the best edge blocker he’s ever coached. Parnell has committed to Central Arkansas for basketball. Andover Central lost 38-29 to Topeka Hayden in Week 7. However, Audley saw his team show “night and day” improvement since the defeat. The Jags rolled over Hayden, 28-2, in sub-state. Andover Central returned just two offensive starters from a year ago, and the line has greatly improved in the last 5-6 weeks. Senior right tackle Alex Menke, a returning starter, did a solid job last season. Audley said Menke learned to “get aggressive” this fall. In sub-state, Menke delivered 10 pancake blocks. Junior Xavier Krumm is a returning starter at center and has yielded a big improvement, too. The offense has improved from 6.7 yards per play in ’14 to 7.5 this season. In Week 6, the Jaguars lost 5-foot-9 senior middle linebacker Thomas Graham, one of the state’s leading tacklers each of the last two seasons, to a season-ending knee injury. The Jags had to reshuffle their linebackers. They played with his backup for one week, and then decided to put senior Dakota Rodd in Graham’s place. Rodd, a former outside linebacker, is a wrestler with size similar to Graham. He has emerged with a team-high 152 tackles. Rodd was able to get underneath Hayden’s trap and contain the running game. At halftime, Hayden had 29 total yards and one first down. “He has made a difference because he is real quick in there,” Audley said.